It’s going to be an ending to the season like no other for Jonathan Spector, the first time the Hibs defender has come across a system which sees the Premiership split in half. But the prospect of facing Scotland’s leading teams in quick succession over the course of the next week is one which the 33-year-old American insists has filled him with excitement. Although Paul Heckingbottom’s players ultimately clinched a berth in the top six with some comfort, that was little more than an aspiration for the players and management when Spector initially arrived on trial before earning a short-term contract. By then, though, Hibs had already embarked on what has become an astonishing run in which they have taken 20 points from the 24 on offer, putting them very much in the hunt for a place in next season’s Europa League. Kilmarnock and Aberdeen, currently six points ahead, remain favourites to clinch a European adventure but, claimed Spector, it’s all to play for as the top teams are pitched against each other week by week. As someone who spent the bulk of his career in England with West Ham United and Birmingham City, the Scottish set-up is something new. “It’s a unique way of doing it but it could be an interesting time,” he said. “We all knew how important it was for the club to finish in the top six, which we have done. “Now we want to push on and see how far we can go in the table. With the run we have been on it’s a great chance to keep progressing, a good opportunity to play the top teams in the league every week. “There is a significance in playing for something. I remember in England finishing mid-table and it was just a case of seeing the season out. Don’t get me wrong, playing in the Premier League is a great achievement, but to be playing for something is exciting. Hibs begin that quest in exactly the same manner as last season, with champions elect Celtic coming to Easter Road on Sunday, the only change being that Neil Lennon will be in the away dug-out. He’s already enjoyed that experience, of course, returning for the first time since a departure, the reasons for which are still shrouded in secrecy, to steer the Glasgow outfit to a Scottish Cup win and so remain on track for a third successive treble. Hibs, however, won this time last year and Spector believes having been over this particular course before – the top six is made up of exactly the same clubs as 12 months ago – will stand Heckingbottom’s players in good stead. Spector’s arrival in Edinburgh, following a couple of seasons back in the United States with Orlando City, was in response to Heckingbottom recognising his squad was a touch light at the back given the season ending injury to centre half Ryan Porteous, the American’s versatility offering cover in a number of positions. 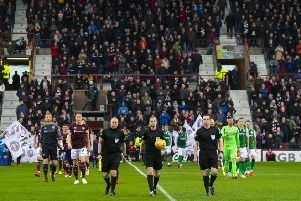 And it paid off as he stepped from the bench to replace skipper David Gray, who had suffered a head knock, during the second half of the latest Edinburgh derby at Tynecastle, taking to the pitch with Hibs leading 2-1 and helping them to notch a first win in Gorgie in six years. Spector said: “I knew at half-time I was probably going to go on so I was able to make sure I was properly prepared for whenever that call might come. I’ve plenty of experience of these type of game so I was able to come on and draw on that even although I hadn’t played first team football for a while. Derbies are all pretty similar, the atmosphere is electric and you feed off that energy from the fans.